Analyzing and predicting trends in any market is a multi-layered task. Trends affecting the food industry as a whole can usually be seen in each specific market, such as the case of convenience and better-for-you foods in the specialty trade. Trends also have a tendency to feed and play off of one another as well, with each lasting a varied amount of time before either falling off the consumer’s radar or becoming a staple. Trends in the marketplace influence every consumer’s behavior. Trends affect the food industry on a zillion levels from specific food choices to changing meal patterns. Not all trends are the same. Some are pervasive, influencing the whole social landscape, others are really just fads. Trends have a life cycle, and the particular stage of a trend is critical in determining its connection to a particular product or service. Trends can exist on many levels. For instance, we can talk about a growing penchant for “hot” foods or dining at home. If both are trends, might one explain the other? Does an understanding of one general sociological trend help explain a specific food trend? How Do Trends Relate to Food Marketing? Successful businesses are MARKET DRIVEN when they design their products and services to fulfill consumer needs. They can define the marketplace through demographics (identifiable, measurable characteristics such as age, economic status, ethnic background etc. ), and psychographics (lifestyle or attitude characteristics). Knowledge of today’s trends can help you develop products and promotions for the future. The world is changing at an accelerated pace. Not much looks as it did 50 years ago. Like every other industry, the food industry has had to adapt to consumer demands driven by changing lifestyles. Good sources of trend information appear in the media. This includes the Internet, which is being used with increasing frequency as a communication means. Several resources look at what’s going on in the marketplace. Targeted to varying audiences, they each have their own focus and format. What they have to say is extremely valuable for developing staying power in the food world. Make your job easier by learning what the experts are saying. 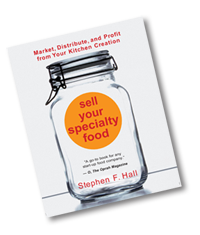 In addition to the professional trade journals listed in Appendix A, the following may be useful in developing a deeper understanding of consumer trends and their impact on specialty food marketing. Provides sales data and analysis of mainly supermarket product activity. American Demographics is a tool for marketing strategists. Readers gain vital insight into the connections between age, education, geography, income, wealth, lifestyles and spending, and find clues as to what consumers want and what they’re likely to want tomorrow. Every issue includes cutting-edge marketing techniques, helpful diagrams and usually exclusive data that help readers to maximize opportunities in key market segments. Subscriptions for U.S. subscribers are $58 annually (ten issues). “Forecast” is a twice-a-month newsletter dedicated to delivering in-depth news and analysis of the Census 2000 statistics to help marketers understand what the information means and what it may portend for the future. Each issue analyzes the latest Census 2000 information to provide insight into consumer behavior, attitudes, and demographics at every level. There is analysis of where Americans are living, how their households are changing, how industries are responding, and trends that project what the America will look like. A one-year subscription to Forecast costs just $269.00 U.S. Website: subscriptions@mediacentral.com. Formerly the Food Channel HotBytes newsletter, The Food Channel TrendWire newsletter has been the food industry’s source for food trends since November 1988. It is published 52 times a year and distributed electronically to subscribers. Individual e-letter subscriptions are $195 per year. Corporate subscriptions are $895. For subscription inquiries, contact Debbie Merritt. Reporting consumer food trends, tracking, analysis and insights drawn from their review of newspapers from ten major U.S. cities and nineteen popular consumer magazines. Published monthly in electronic and hardcopy formats. Subscriptions are $60.00 per year. Providing the world’s premier editorial coverage of new product development, Mintel’s GNPD is a comprehensive database that monitors worldwide product innovation in consumer packaged goods. Mintel’s GNPD offers unrivaled coverage of new product activity for monitoring competitors and generating new product ideas.